PARX brings together the best of two worlds in Salesforce projects. 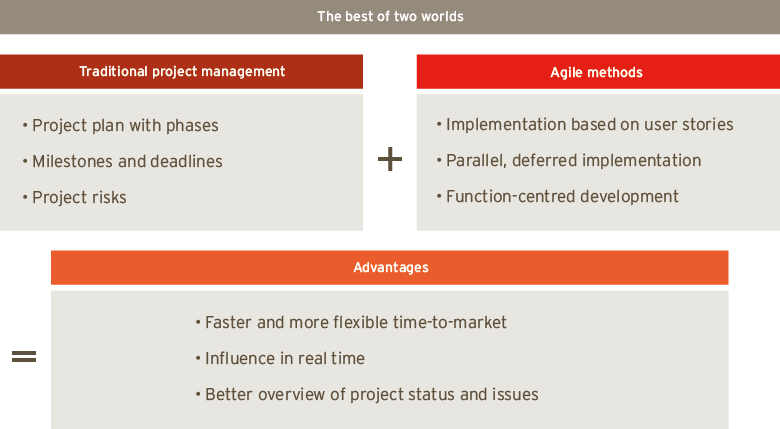 On the one hand, we employ proven elements of traditional project management and on the other we use the methods of agile software development (SCRUM). The traditional elements include the creation and maintenance of the overall project plan with project phases, intermediate checks and deadlines, management and communication of risks and project progress and cost control. With agile project methodology, we implement the iterative, customer-focused process with short release cycles of testable function packages (user stories). 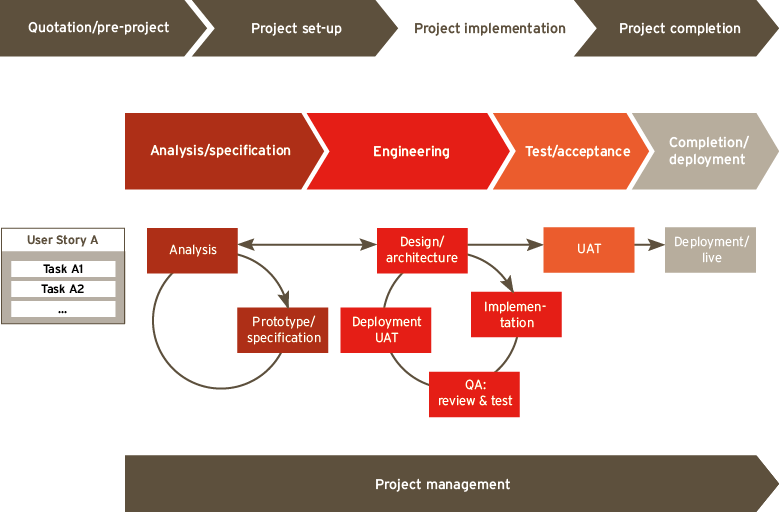 The function packages pass through the four phases of project implementation independently of one another. Particular emphasis is placed in this context on close contact with and interaction between the people involved. In the quotation and pre-project phase, we ensure that an overall picture of the needs and requirements of the customer that is as comprehensive as possible is maintained. In this way, we draw up a meaningful quotation that then serves as the basis for the project. 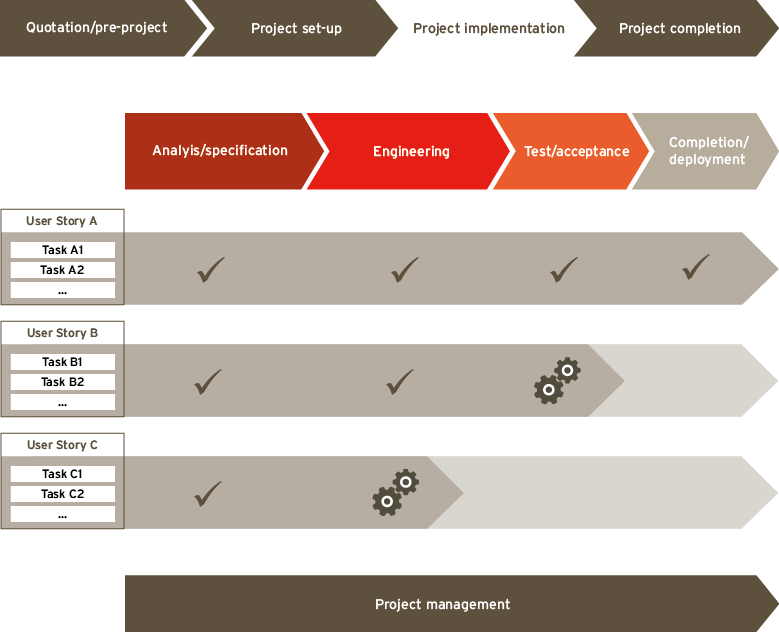 The staffing of the project is organised in the project set-up phase. The project is handed over to the project team. At a joint meeting between the customer and PARX, the starting pistol is fired, and this is frequently followed by a workshop to add detail to the specifications, scrutinise and prioritise them. In the implementation phase, the overall project is divided up into smaller function packages. After successful testing and approval by the customer, the package in question can go live at the desired time. Even at the specification stage, engineering should be involved in order to work out the appropriate solution design. Points of confusion can therefore be identified early, problems avoided and resources saved. Once the solution design has been determined, the actual implementation begins. This can take place in the form of configuration and/or technical (programming) development. Each individual package created is first tested internally and compared with the specification. If all of the requirements in terms of content are met, acceptance testing by the customer is carried out. This takes place by means of User Acceptance Tests (UAT) in a test environment. The customer therefore checks the results at an early stage in the project. Surprises or the discovery of misunderstandings only at the end of a project can therefore be avoided and expectations can be met or even exceeded. The Force.com platform constitutes the working environment of the engineering team and already provides a large number of functions. These include web applications such as View-Design, data management, a test framework, a validation engine, workflow, user and rights administration, security, deployment and operation, monitoring, performance optimisation, etc. Before initial use, the anticipated support services are addressed and established. The aim is to guarantee customer satisfaction even after completion of the project. On conclusion of the project, the project manager briefs the PARX service team and hands over the project. All support cases and their status can be viewed on the PARX customer portal. Which methodologies does PARX use in projects? We give you an insight into our approaches. From the programming language and the application architecture through to the testing procedures and models that we use in designing the best possible «usability» – we provide you with all the information.